Although they were launched all the way back in March 2007, there is still some confusion about the 03 number range. It is maybe understandable that when faced with a number prefix they're not sure about, people will be wary of it. Thankfully, most people today are now aware of 03 numbers and are unafraid to call them. Just to clear up any confusion, 03 numbers are the non-geographic equivalent of 01 and 02 numbers. Whereas 01 and 02 numbers are tied to specific regional locations (e.g. 0121 is Birmingham, 0207 and 0208 are London, etc. ), 03 numbers are national numbers. However, 03 numbers are charged at exactly the same rate as regular 01/02 numbers, which makes them an ideal choice for general business use when it’s not important to signal the business only operates in a particular area of the country. Just like with 01/02 numbers, calls made to 03 numbers are covered in any inclusive minutes packages from both landlines and mobiles. 03 numbers are versatile and very fairly priced for both the caller and the operator of the number. The two main types of 03 number most commonly seen are 030 numbers and 033 numbers. 030 numbers (also known as 0300 numbers) are reserved solely for use by registered charities, public bodies and other non-profits. Proof of status is required before they can be set up, so if you see an organisation using an 0300 number, you can be confident they are a genuine charity or other not-for-profit. Numbers starting 033 are for more general use and are available to everyone, making them a great choice for businesses that want to project a national presence. 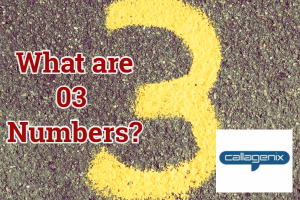 At Callagenix we offer 0333 numbers, but you may also see 0330 numbers being used – they operate in exactly the same way. Occasionally, you may still come across different 03 number ranges, such as 0344 and 0370 numbers. These were originally conceived as being alternatives to 0844 and 0870 numbers. Organisations were offered the chance to keep their existing number but swap over the prefix from 08 to 03. Although touted as being of benefit to callers, as the main number would stay the same, in reality this just caused confusion and uptake was low. Still, there are still a few of these numbers in use today. Adding an 03 number to your existing service is straightforward. If you are a Callagenix customer, you can choose one (or more) and add it via your online control panel. You can then connect it to any of your active services, or set up new ones. Of course, you could just set up an 03 number and then divert all calls onto your current landline or mobile if you like. If you're not yet a Callagenix customer please get in touch and we'll help you get up and running. We also have a wide range of memorable 03 numbers available, if you would like one for your business. These work exactly the same as regular 03 numbers but they're just easier for your customers to remember (e.g. ending in 1234 etc.). This can lead to more calls and creates the impression that you're an authority and a big player in your market. The price depends on the number itself, but in all cases it’s a one-off set up fee, with no renewal fees or other hidden charges. If you have any questions about 03 numbers and whether they are right for you, please get in touch and we'll help you work out whether they are the best option for your needs.